Venetian Macau has become one of the important hotels to visit in Macau beside Grand Lisboa Casino Hotel. Grand Lisboa boasts the most outstanding architecture while Venetian boasts the biggest in Macau. It is so huge that you could spend hours walking inside the hotel and may get lost. It is even bigger than any hotel in Las Vegas. Check out the top 12 things to know! There are free shuttle buses from the Macau Airport to Venetian Hotel every few minutes. Do take advantage of that. Once we landed in Macau Airport, we took their shuttle bus to Venetian, it about 10-15 mins from the airport. Not the real Rialto Bridge in Italy of course but located outside the Venetian Hotel. Great for photography. The Italian bell tower can be seen outside the Venetian Hotel. Not only the exterior of the Venetian Hotel is inspired by the Venice theme. Upon entering the hotel, you realized more of the design of the hotel and casino resort was inspired by the Venice theme. Look up the ceiling are the intricate painting with all the angels. The hotel has a false ceiling painted with clear blue sky, it is another interesting thing you will notice. There are several bridges above the man-made canal which are great for photo opportunities. The backdrops of the colorful building and the fake sky make a perfect shot. Never experience a real romantic gondola in Venice? Nevermind, try the Gondola Ride in Venetian Macau, it should be a fun ride. The gondolas used in Venetian are claimed to authentic Italian gondoliers shipped in from Venice. Tickets are available at Boutique di Gondola (shop no. 832) and Emporio di Gondola (shop no. 891). The Gondola rides start from 11 am – 10 pm. Venetian is so huge, it has 550,000 square meters of dedicated gaming space; 800 gaming tables and 3,400 slot machines known by the local Chinese as “hungry tigers”. 10. How many hotel rooms? Venetian Hotel has 3,000 rooms and suites and you can see the swarm of mainland China tourists waiting at the lobby. Special tips – Avoid these timing; May 1st and October 1st these two golden weeks holiday in China. There are a baggage service and small fees to pay – HKD/MOP 30.00 (SGD 5.20 or USD 3.80) for one piece of baggage. I almost use the baggage service in Venetian to keep my 2 baggage as my hotel is in the Grand Emperor Palace but luckily did not because the hotel is so big and I don’t think I could remember the way to come back here. I am glad I did not. If you have a small trolley bag, it is ok to pull inside Venetian and walk around as the floor is very smooth and won’t spoil the wheels of the trolly bag. Food option at Venetian Macau are in abundance so there is no shortage of choices. There is food from all over the places and we choose to have dim sum from Tim Ho Wan. This set of Tim Ho Wan dim sum cost HKD 181 (SGD31.30 / USD 23.10), quite expensive and I am sure you could get cheaper dim sum outside the hotel or at Hong Kong. But who cares, we are too hungry. There are a lot of free shuttle services in Macau offered by big hotels and casinos, so you don’t really need to take a taxi to major tourist spots. Furthermore, you do not need to be a guest of the hotel to board on their buses because the driver will not ask you at all. The reason is simple, they wanted to lure you into their casino den and spend money. There are other interesting hotels in Macau which you may want to pay a visit. Check the following list out. Not far from the Venetian, it is the Parisian. I was not able to shoot a very good picture of this imitation of Eiffel Tower (only half scale of the real one) which stood in the front of Parisian Hotel. If you have not seen the real Eiffel Tower, do drop by and check it out. Inside there are high-end shopping, restaurant dining and adopt the Paris theme. An interesting building called Morpheus hotel also located in Cotai Macau. It was designed by the late Dame Zaha Hadid, a spectacular and talented female Iraqi-British architect (1950-2016). There are a few holes in the building. There is a figure 8 shaped Ferris Wheel forms a huge hole in the side of the Studio City Casino building. You can spot clearly at night when there is light up. Also located in Cotai, the Galaxy Macau is another eye-catching building which dressed in gold. The resort consists of six different hotels, each with its own ‘theme’. Sands Macau situated near the ferry pier. It is owned and operated by the Las Vegas Sands Corporation. The Venetian free shuttle bus brought us to the ferry pier and next to it is the Sands casino hotel resort. We walked over to the Fisherman Wharf and pay a visit, there is no entrance fee. Macau city is about gambling, gambling, and gambling, there are more than 40 casinos and could be even more but the biggest is The Venetian. Do use the free transport if you are coming either from Hong Kong by the ferry terminal or Macau Airport. I had no idea there was a Venetian in Macau (not shocked at all now that I think about it, but still!). It looks almost identical to the one in Las Vegas! Macau is definitely somewhere that I’m dying to get to! This is such helpful travel information. I can’t wait to visit here some day. Oh wow! These 13 things were so amazing! I am really glad to know all this. Huge of information! Wow, what an amazing resort! It looks absolutely beautiful and the sky ceiling is a stroke of genius! 3,000 hotel rooms is insane! We live in Veneto half the year, so it’s always fun seeing replicas around the world. I remember visiting Macau but never seeing this hotel. I’ll need to go back one day! 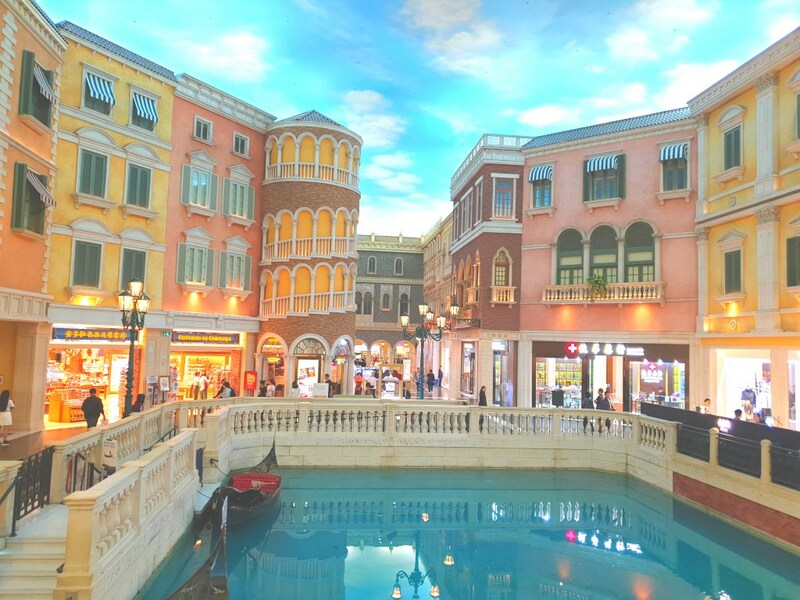 Thanks for sharing this useful post on the various activities inside Venetian Macau resort. It will be helpful for guiding those who are visiting Macau. My friend was actually inviting me to visit Macau last year with her but unfortunately I can’t because of my work. This is really informative about this place. The resort grounds are beautiful! I’ve never been but it looks like a wonderful place to visit someday. Macau looks like a nice place to visit. I like the structure of the buildings. So lively place.